The North Valley Regional Recycled Water Program (NVRRWP) conveys highly-treated wastewater from the City of Modesto’s tertiary treatment plant to the Delta Mendota Canal (DMC). 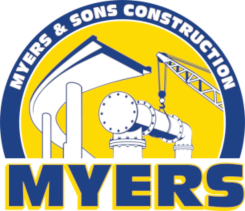 Myers and Sons Construction teamed with Joint Venture Partner Steve P. Rados and design engineer MWH/Stantec for this important regional solution to address water supply shortages faced by agricultural customers in California’s Central Valley and also deliver water to refuges in the area. An estimated 35,000 acre-feet per year of water will be delivered by the conveyance facilities built by Myers-Rados JV (MRJV). The project includes approximately 7 miles of 42-inch diameter pipeline, 32 MGD pump station, a 2800 foot long horizontally directionally drilled (HDD) crossing of the San Joaquin River, a 480 foot bore and jack below Highway 33 and Union Pacific Railroad tracks and an outfall at the DMC.